Texture, color, taste - this dish is a delicious melding of flavors and textures featuring rice, nuts and kale sauteed in vegetable broth and seasoned with herbs. This Seasoned Rice and Kale recipe came about as I was thinking about how much I enjoy kale. I thought I would blend the dark green goodness of this vegetable with some brown rice, and herb seasoning and finish it with added texture by putting in some chopped walnuts. It works! The flavors and textures are a mouth-pleasing treat and make for a healthy, delicious meal. 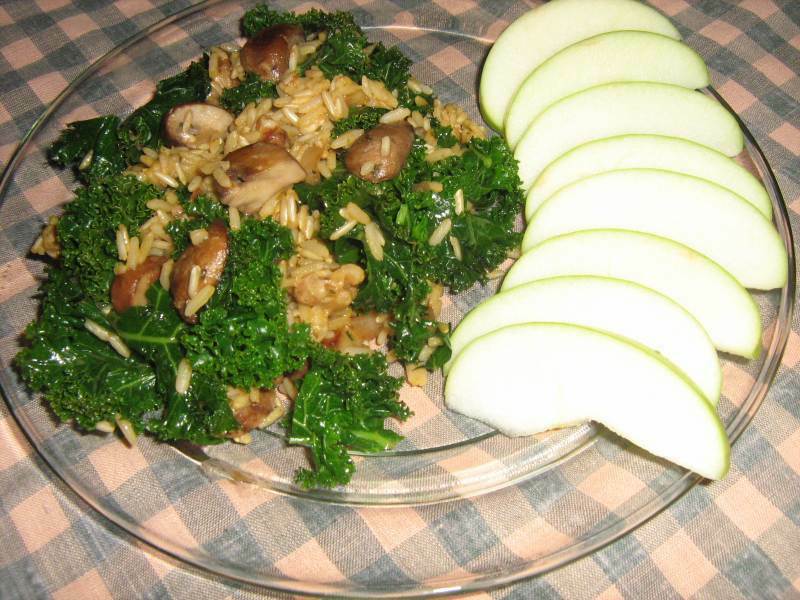 Enjoy this seasoned rice and kale dish soon! Add the vegetable broth, Smart Balance, onion powder, Italian seasoning, parsley and thyme to a large saucepan. Bring it to a boil. Add the rice and the soy sauce and allow to cook for about 8 to 10 minutes. Meanwhile, add the oil to a large skillet and heat over medium high heat. Add in the chopped onion and sauté for about 5 minutes. Add the mushrooms and continue to sauté for another 5 minutes. Then add the kale. Reduce the heat to low, cover and cook until the kale has reduced and is a bright green (about another 10 minutes). Reduce the heat on the rice to low, stir in the chopped walnuts, cover and simmer for about 15 minutes or until the broth is absorbed. After the rice is cooked, fluff with a fork and gently toss in the sauteed vegetables. Serve warm.